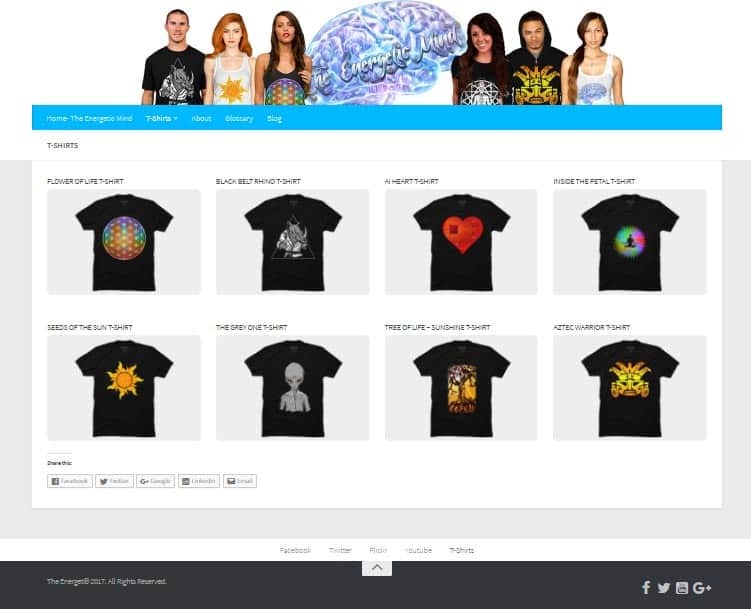 "Your website is an online shopfront for your brand / project / products. Your website works for you 24 hrs a day, 365 days a year. It could be your best employee or your worst." Robb Wallace Media Websites built by Robb Wallace in Glasgow | SEO optimised | Fast loading | Responsive | Hosted | Website blog included. Contact us now for the best price. I can create simple, clean, responsive websites for your online presence. A website is your online calling card, it is your businesses landing page, a place to keep your customers informed, a place that is accessible 24/7 with key information, it is your link to your customers. On this page, you will find information about how I build websites, our prices and some examples of websites I have built for clients in and around Glasgow, Lanarshire, Ayrshire, Perthshire and more . Contact me to see how I can help your business grow. Our websites are built to be fast, easy to navigate, responsive (displays well on phones, tablets, laptops and PCs), with good SEO practices (Search engine Optimisation ie good visibility by Google). We are competitively priced and can hand over full control of the website, blog etc to you once the site is built. 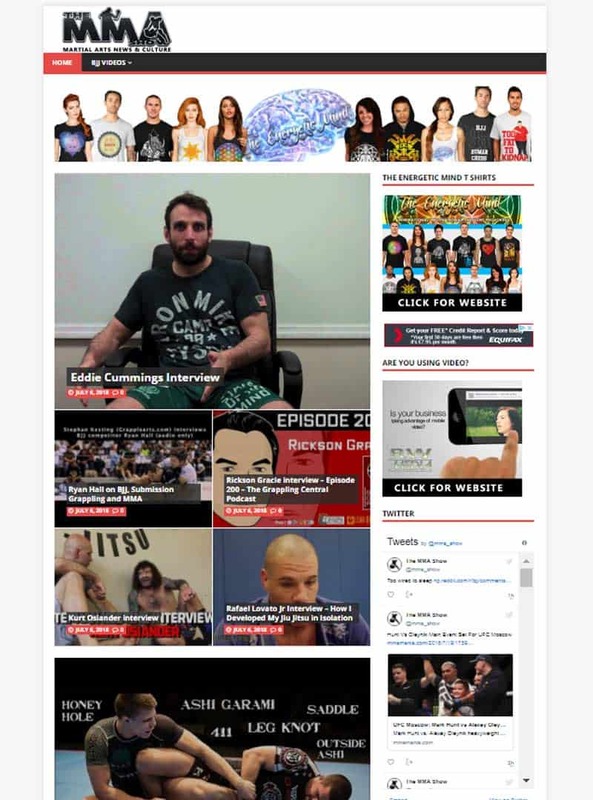 Every website comes with a media consultation. Our basic website starts at £1000, this is a simple responsive website (Max 8 pages) that is optimised (images, SEO) and includes hosting for one year. Hosting is £100 (for a basic site) per year afterwards. Websites can be optimised for keywords, speed, social, security, google maps and more. Let me know what your project needs and we can work a solution tailored to your business needs. I offer a Digital MOT for a full over hall over your digital presence, this can be incorporated into the planning stage of your new website at a reduced price. What goes into building your website here at Robb Wallace Media? We create a website brief. This is where we discuss the project, be it a new website, a redesign of an old site or just some simple updates and improvements. We will talk about the size of the website, it's purpose and pricing. You can choose a new domain name for your website or we can use one you already have. We discuss the key content that will be displayed on the website and create a plan for you to generate relevant engaging content. There are over 200 unique factors that Google uses to rank your website for each independent search it receives. We will work on the key components of SEO to make sure your new website is ticking all the relevant boxes. We can create and edit all images etc in house, we make sure that all the websites images are optimised for the WEB, this is one of the 200 factors Google looks at. Optimised images also increase the overall speed of the website. No one loves a slow website!! We can add a secure https to any website, this is provided by Mcafee or Lets Encrypt and makes your website secure. The HTTPS is recognised worldwide as secure for payments and other sensitive data. We also install word fence (a firewall) on all of our websites. If needed we can set up a Cloudflare or CDN for your website, which is extremely handy if your site is being accessed from multiple international locations. Giving faster load times from multiple access points across the world. We will set up tracking through Google Analytics which allows you to see who accessed the website and from where and when. A powerful tool that gives you real data about your potential customers. We link every website to their respective Social Media channels be it Facebook, Twitter, Youtube, LinkedIn etc. We can also provide FB messenger and Social Media share buttons. Every Website comes with a short Social Media Review where we will look at your channels and give some insights, tips and tricks to help boost engagement. We will show you how to manage the basics of your website allowing you to update your site with confidence. Update your content, prices, dates etc, create blogs and manage your own website on a weekly basis with confidence. 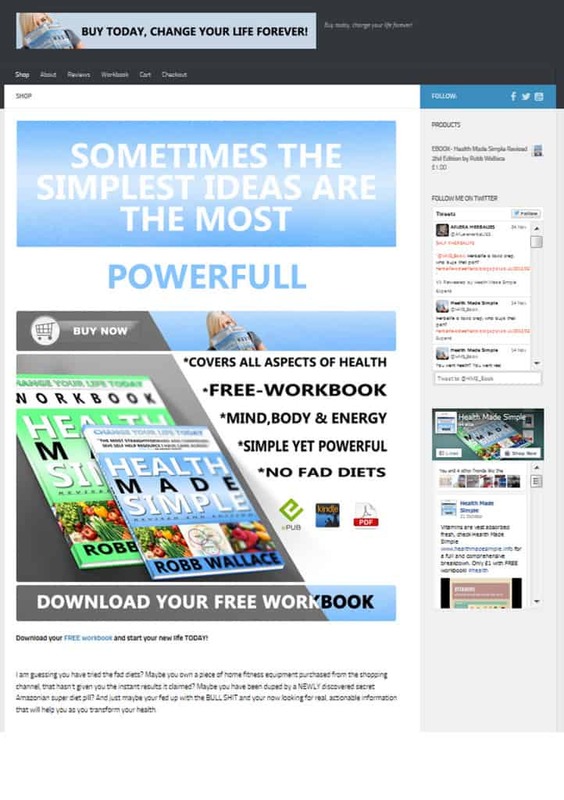 These are just some of the things that go into a Robb Wallace Media made website. Contact us today to see what can be done for you. A media revolution for everyone. Brief – A secure website built for direct book sales. Key Criteria - Secure https://, payment portal via Paypal and fast. 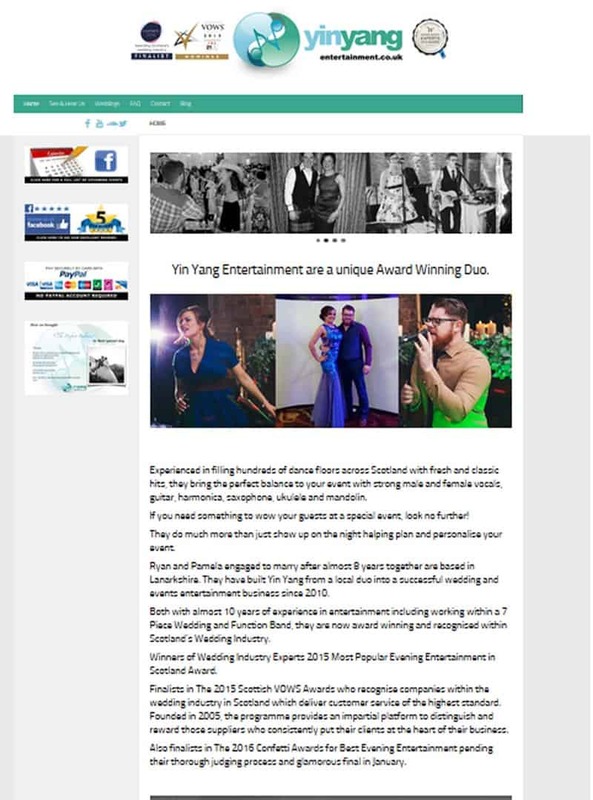 Yin yang Entertainment is an award-winning wedding band from central Scotland. Brief - To update their website with a new fresh design, increase their web presence, integrate social media, audio, video and images. Key Criteria - Facebook integration, testimonials, an extended contact form/ booking form. Brief – A website built for direct sales. Key Criteria - Product options, payment portal, secure and fast content delivery from the UK and the USA. Advocate for voluntary and community organisations. Brief - Recover, reclaim and rebuild their website that had disappeared when their old host went bankrupt. Key Criteria – Easy to navigate, responsive, new functions and contact details. 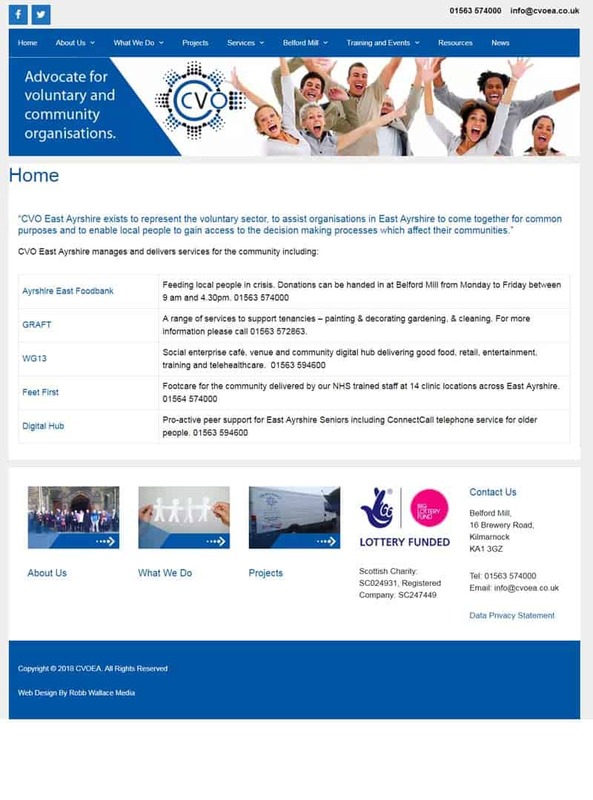 Website Location - Kilmarnock, East Ayrshire. 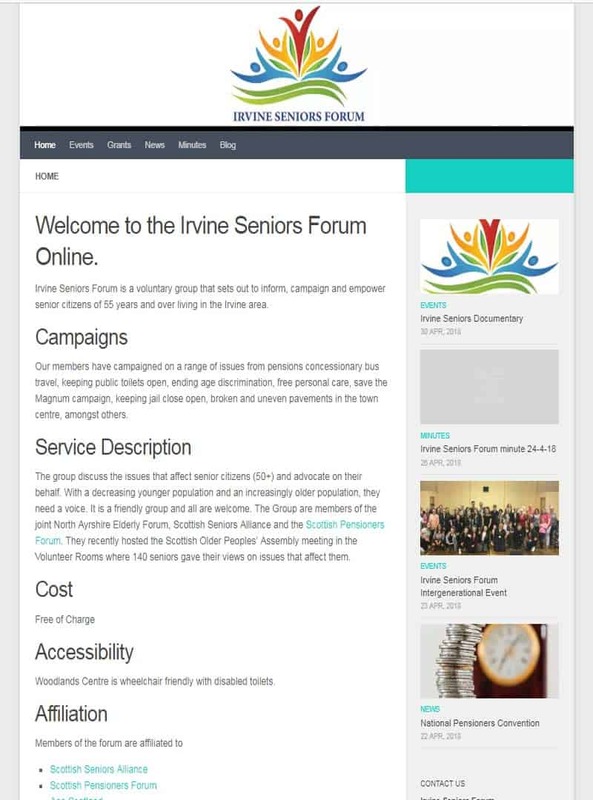 Brief - A simple responsive website that informs the community about issues related to the elderly in Irvine, Ayrshire. Key Criteria – Easy to navigate, Accessibility functions, location map, responsive and contact details. 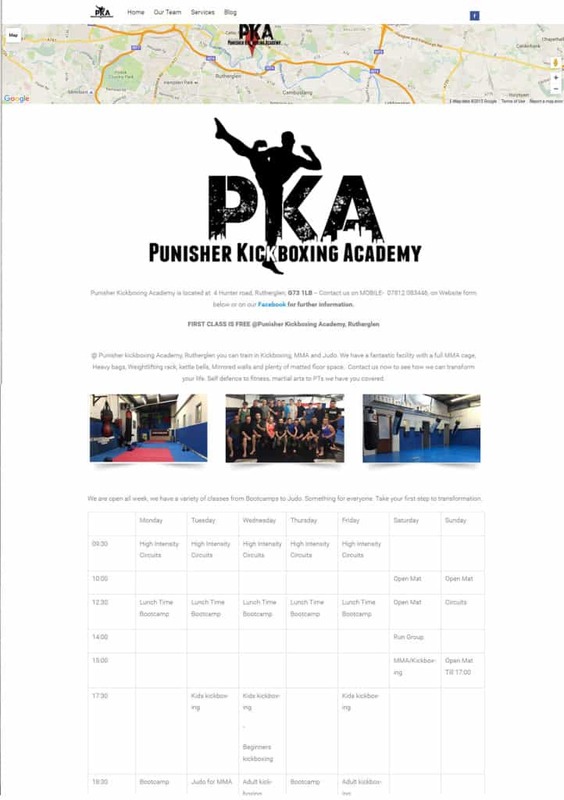 Punisher kickboxing is a family-friendly gym based in Rutherglen. Brief - A simple responsive website that hosts the gyms timetable, class descriptions, instructor information, location map, blog and linked to their Facebook and Instagram accounts. Key Criteria – Easy to navigate, Facebook integration, location map, responsive and contact details. Brief - A magazine/blogging website accessible by multiple admins. Key Criteria – Mobile responsive, advertising space, fast loading, share buttons. The Podcast that questions everything. 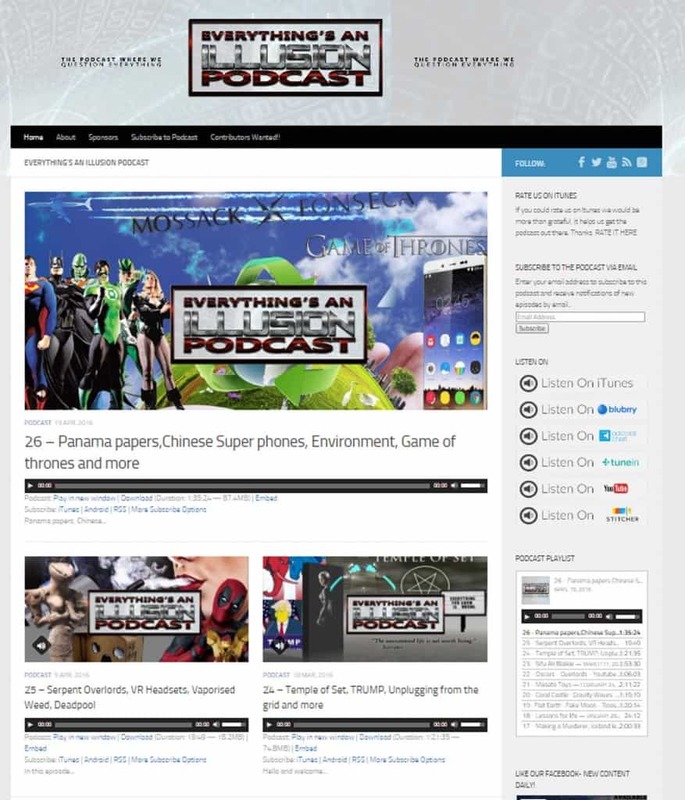 Brief – Podcasting website with good SEO, Twitter, Facebook and Youtube integration. Key Criteria - Host and play podcasts, social media integration, adverts. Buy today change your life forever!! Brief - A website built to deliver digital ebooks direct to the customer after payment. Key Criteria – Mobile responsive, ebook delivery and hosting, payment portal.